Our Perth accommodation features 239 well appointed rooms, along with a restaurant, cafe, heated rooftop swimming pool, spa & gym. Indulge in the incredible international cuisine at our Perth hotels very own Beccaria Restaurant, you wont be disappointed Business guests are well catered for at the Mercure Perth hotel, with a number of conference and meeting room options. Mercure Perth conference rooms can accommodate 350 delegates and a range of different event packages. Fabulous from check in to check out! I have stayed here many times now. It is a convenient location and loyalty program makes the room very reasonably price. Rooms always immaculate, food of a high standard and the staff 10 out of 10 for service and friendliness. Fantastic. I thought the breakfast deal when booking through Accor website was what got me over the line to book with you. It didn't let me down. Always very comfortable beds in a Mecure - this is extremely important when working. The staff were super friendly and helpful. The $35 a night parking is probably the only thing that has me shopping around for other accommodation. Friendly staff, comfortable rooms making a very happy and enjoyable stay. Excellent meals that made our stay even more pleasurable. From the second we arrived, everything was just so easy. I felt so relaxed. The staff were easily the nicest hotel staff I have ever met. The room was beautiful, comfortable and had everything we needed. We stayed in room 822 and the airconditioning motors were obviously above our room. The motors started up and stopped all night. They were very loud. Other than that our stay was great. All facilities were adequate. The restaurant was really good, dinner meals lovely and good choices for breakfast. Decor in hallways and general areas quite dated. Excellent,was only there one night but i always stay there when in perth. The staff were very welcoming and helpful throughout our stay. We were upgraded to a large, comfortable room with a nice outlook. The hotel is without n easy walking distance of the city centre, railway station and parks. Stayed before. Good, reliable service. Fine. Clean room and friendly staff. 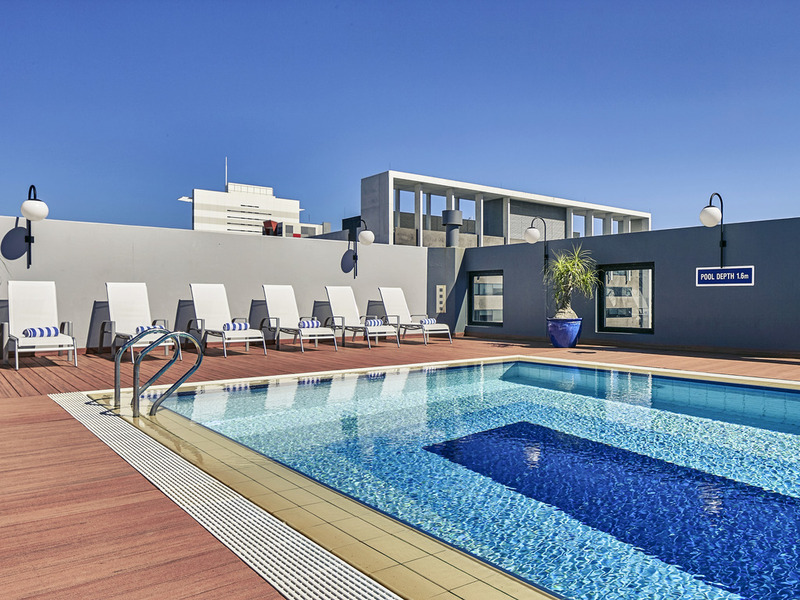 Mercure Perth is in a great location and the staff are always friendly and helpful. The $1 breakfast deal was a great bonus. The tired state of the rooms is reflected in the price which does offer good value. Just a few small tweaks would make a big difference. For example no-one checks floors for room service trays so as you walk from your room to the lift it's common to see trays left outside doors for hours - often late afternoon to after 9am which isn't a good look. And no-one seems to check rooms on check-out for maintenance issues. On three visits we have had faulty lights (this visit both the bathroom and one bedside light flickered on and off). It would be great if someone checked the lights and safe are working and that the clock alarm is turned off when the checkout clean is done - ready for the next guest. Easy check-in and out. Confusion with the lifts even though the check-in desk lady did explain to use the first set of lifts. The shower head had poor pressure and took a while to get hot. The beds were very comfortable however the pillows were a bit flat. Room service didnt answer so my friend went down to get ice, but they delivered it so that was nice. Also when my friend inquired about a smoking area, someone mentioned the pool area however neglected to state it closed at 9pm. So when we returned from our night out she had to stand out the front of the hotel on a busy road with no chairs like she was, and i quote &quot;a problem&quot; so she felt dirty. This may need to be addressed as smokers do not have a curfew and they may have a bad habit but are still patrons of the hotel. Breakfast was very nice however I would have liked more options for my eggs. The coffee machine ran out of milk but was quickly rectified. Overall a very pleasant stay for right where we needed to be situated in the city and it was a plus that we were able to book with a Groupon. Service in restaurant was slow but food good. Room clean, pleasant and bathroom spotless...although I do prefer showers separate from baths. Getting older, it is safer. Check in and out very efficient and help with taxi appreciated. This was only a short overnight trip. The room was clean, comfortable and reasonably quiet. Breakfast at the restaurant was served without any issues. Had a slight issue with the bathroom light switch and noted this down at checkout. The breakfast was great with plenty of choice. Rooms were clean but bathroom was a little dated. There was not where to hang your hand towel other than over the bath. In other motels the checking in staff walk you through the WiFi connection process. I worked that out myself. I am not sure if there was an airconditioner in the gym but I work out before 6am every morning and it was very hot. And finally I did not like that the cleaning staff took the water bottle I had left on the bench. I like to reuse my bought water bottles. The hotel is in a great location, on arrival I was disappointed to get a room with 2 double beds as I had booked a superior king room, then told that the hotel was full. However your receptionist Ashleigh is an asset to your business, she made me feel like she understood my frustration and was very helpful. A huge thank you Ashleigh. An amazing ambassador for the Accor brand. Room & bathroom sizes are good, however I stayed in a room on the 3rd floor overlooking what seemed like a car park (room 333) and it was so noisy most nights, and also you can hear when someone is showering in your neighbouring rooms - I struggled to get a decent night sleep during my 7 night stay. A colleague of mine stayed on a higher floor in the same tower, not facing over the car park and he advised there was no issue with external noise so suggest requesting a higher floor. Breakfast was hit and miss, although I appreciate it was a busy week which might explain some of the shortages of things, and some staff were more obliging than others when advised of the coffee machine being out of coffee. Reception staff were always helpful and pleasant. Our check in was easy and the team accommodated us post stay by holding on to our luggage for our late flight out. Very nice stay. The size of the ‘privileged’ room type is perfect! Love the roof top pool, perfect temperature. Breakfast was really good too. Staff are helpful and friendly. Thanks for the bottle of wine on arrival, really nice touch.